1.Grooved bracelet designed is very popular in United Stated, especially for teen girls and adults women. 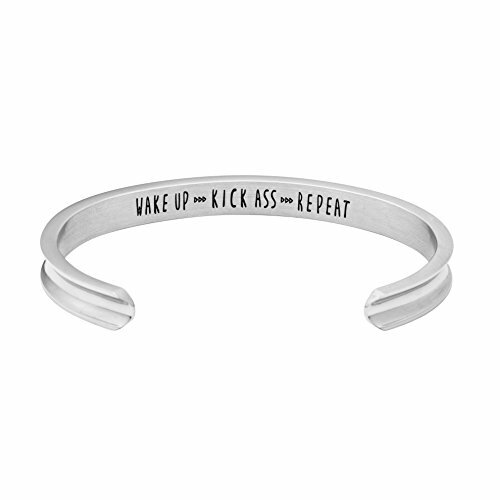 2.Hidden Message bangle as a jewelry is meaningful as a religion gift. 3.The size is adjustable for most people and adjusted easily. 4.This bracelet wear comfortablely and take off easily, you can wear it in your daily life. Every bracelet'quality will be double checked, and high-quality polished many times to keep surface smooth and shine, so it will be very comfortable and beautiful to wear it. How to take care your bracelets? 1.Don't let your cuff bracelet touch Acid Alkali and other Corrosive Chemicals. 2.Don't wear bracelet when you sleep, bathe, sweat, sport. 3.Keep your bracelet in gift box, mirror polished bracelet should be avoided touching sharp things, we suggust to clean with soft cloth. If you have any questions about this product by Yiyang, contact us by completing and submitting the form below. If you are looking for a specif part number, please include it with your message.